Congratulations to Coach & Matt H on winning this years Survivor League. 2: If they lose you are out. However if you lose between the weeks of 2 thru 6 you can re-buy once for $75. You must re-buy the week you are knocked out to continue on. Plus the teams you have taken are still used, so you can not use them again. 3: Suicide part of the league is you are not able to pick any team twice. 4: Picks must be in Saturday Night 6pm. Thursday games are not going to be an option in this league, only Sunday and Monday games. 5: If you fail to get your pick in by Saturday Night you will be given the Visiting team on Monday Night Football. If you have already picked that team once you are then done and out of the league. ***Note I will not chase anyone down for their pick! 6: A Winner is determined when there is only 1 person left. The option to split is allowed when only 5 players are left and it must be unanimous amongst all remaining teams. 7: If by chance the league lasts thru the regular season the remaining players will split the money. The league will start Week 2 of the Regular Season. The Games will be straight up No Spreads. 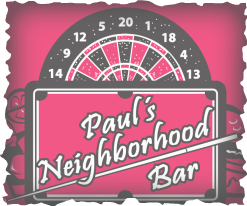 ***once you sign up you can email picks to paulsneighborhoodbar@gmail.com if you are unable to make it in to the bar.